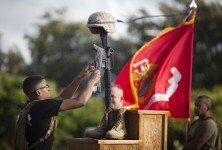 Kaneohe Bay Marines marked the end of an era with a ceremony to commemorate their sacrifices and achievements. 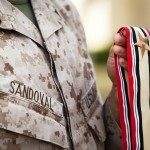 It’s one of the rare opportunities when the whole regiment can share the honor. 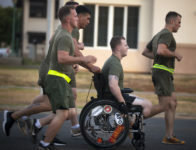 “This is one of the first times in recent memory here in Kaneohe Bay as long as the 3rd Marine Regiment has been here that we have had all of our battalions back aboard this station,” said Sgt. 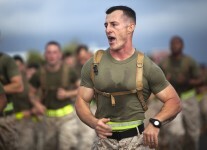 Major Justin Lehew. 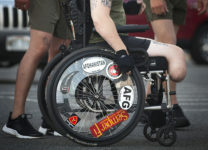 That’s because for the past eight years, at least part of the 3rd Regiment has been deployed to either Iraq or Afghanistan. About 900 of them came back Sunday. 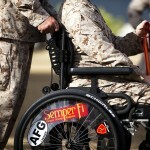 They were the last Hawaii based Marines scheduled for deployment. 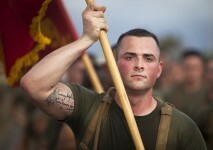 The ceremony marks the end of a chapter in 3rd Marine’s history that goes well beyond the past eight years. This was also a chance to reflect on their accomplishments in the many battles fought over the past 96 years. “We want to make sure that we commemorate our entire history and reflect upon all of those who have served in this regiment over the years,” said Colonel Nathan Nastase. So battle streamers were pinned to the flags during the ceremony. The third regiment has proudly earned 17 of them dating back from World War One to the Global War on Terrorism. “To be chosen as the carrier of this flag was an honor it was a privilege it was a different feeling being up there,” said Corporal Sam Gonzalez. 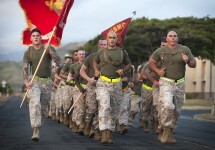 Eight years of continuous war in Iraq and Afghanistan are over for the 3rd Marine Regiment’s 3,000 Marines at Kaneohe Bay, officials said. 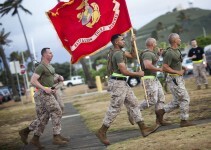 A ceremony will be held at 7 a.m. Thursday to re-dedicate the regiment’s battle colors with awards earned in war and peace over the past 96 years, and to officially mark the regiment’s final combat deployment to Afghanistan — a tour by the 3rd Battalion, 3rd Marines, who just returned to Hawaii. More than 3,000 Marines and sailors of the 3rd Marine Regiment will stand in formation during the hourlong ceremony that will include presentation of the regiment’s 17 award streamers, which will be attached to the regimental battle colors. 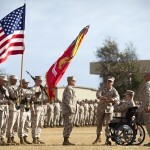 “The ceremony will reflect on the success, dedication, and sacrifices of the regiment during combat operations in Iraq and Afghanistan, as well as honor the history of 3rd Marines and pay tribute to brothers lost in combat,” the Marine Corps said. 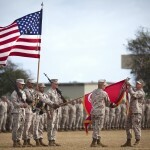 The ceremony marks the close of a chapter in the 3rd Marine Regiment’s history as it ends its deployments in support of Operation Enduring Freedom. 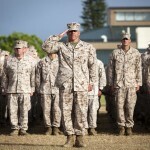 About 1,000 Marines with the 3rd Battalion, 3rd Marine Regiment, returned home last week from Afghanistan as the last Hawaii-based Marine infantry battalion that was scheduled to deploy to Afghanistan, officials said. 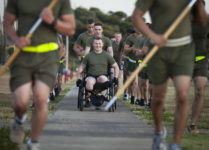 The regiment’s three battalions will continue to train and deploy overseas to Japan and other locations as part of a resumption of what’s known as the Unit Deployment Program, which was cut back during the height of the wars. 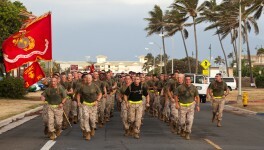 In July 2004, the 1st Battalion, 3rd Marine Regiment out of Hawaii left for Okinawa on a UDP rotation to be part of the 31st Marine Expeditionary Unit, but was re-routed to Kuwait and then Iraq to take part in the Battle of Fallujah in November of that year — becoming the first Kaneohe Bay infantry battalion to fight in either of the wars. 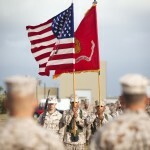 Eight of the Marines were killed in a suicide car-bomb attack; 11 more Marines perished in ground fighting — most of them in Fallujah; and 26 Hawaii Marines and a Navy corpsman were killed in the crash of a CH-53E Super Stallion helicopter in a sandstorm on Jan. 26, 2005 on the deployment. Hawaii-based Marine Heavy Helicopter Squadron 362, the “Ugly Angels,” are on the last deployment to Afghanistan with the CH-53D Sea Stallion helicopters that were based at Kaneohe Bay, officials said. The Vietnam-era helicopters are being retired. 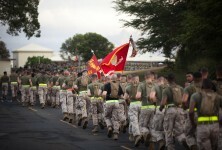 MARINE CORPS BASE HAWAII – After almost a decade of fighting wars overseas in Iraq and Afghanistan, all three battalions of 3rd Marine Regiment honored their fallen Marine and sailor brethren during Operations Iraqi Freedom and Enduring Freedom with a memorial run and ceremony on Marine Corps Base Hawaii, June 1. 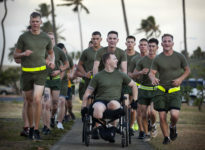 The battalions of 3rd Marine Regiment ran in a single formation that stretched more than half-a-mile and called cadences throughout the three-mile run around the base. Upon arriving at Landing Zone Boondocker Training Area, the battalions formed up to begin the ceremony. 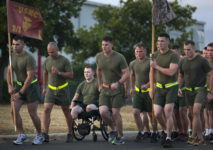 Each Marine wearing a black t-shirt was carrying an identification tag of one of the 116 Marines and sailors killed in action. 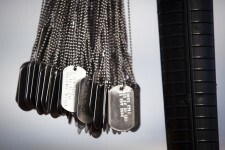 After each name of a Marine or sailor killed was announced, the Marine carrying the corresponding identification tag came to the front of the formation and hung the tag on the battlefield cross memorial that represented every Marine and sailor killed in Iraq and Afghanistan. 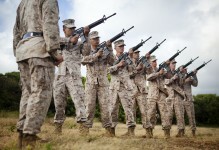 After the last name was called and his identification tag was hanged on the memorial, the Marines and sailors of 3rd Marines came to attention as a three-volley rifle salute was fired and taps played, echoing throughout the training area. The ceremony was concluded with a few words from Brig. Gen. Frederick Padilla, commanding general of 3rd Marine Division, and Col. Nathan Nastase, commanding officer of 3rd Marines.